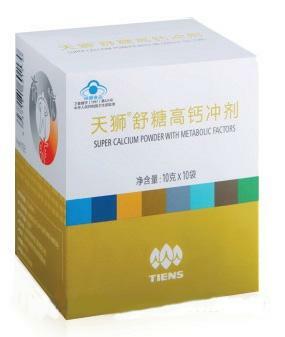 Super Calcium Powder with Metabolic Factors is specially formulated for diabetes by removing sugar while adding a pumpkin recipe (pancreas mender) to number one above. All natural ingredients, no sucrose, low in fat and calories. 1 bag (10g) contains more than 360 mg of enzymolysis bone calcium powder. Pumpkin flour added contains CTY (cyclopropyl amino acid, a blood sugar lowering factor), which can effectively regulate the secretion function of pancreatic gland. Contains 18 kinds of amino acids, collagen, phosphoprotein, minerals and vitamins. Protect the pancreas, supplement calcium, lower blood sugar, equalize nutrition and prevent diabetic complications. Contains oligosaccharide, which can stimulate the multiplication of bifidobacteria in intestinal tract, maintain the normal functions of intestinal tract, and enhance immunity. Super Calcium Powder with Metabolic Factors is specially designed for persons with hyperglycemia and diabetics. Take with warm water (60-70 °C) or other foodstuff.